The material of the tread is elastic vucanization soild ribber, and the material of the rim is polyamide. The material of the housing is steel,and the housing surface is blue zinc plated . The hardness is Shore A 68+5,and the temperature range is -20 degrees centigrade to +85 degrees centigrade . The capacity of the castor is 230kg. 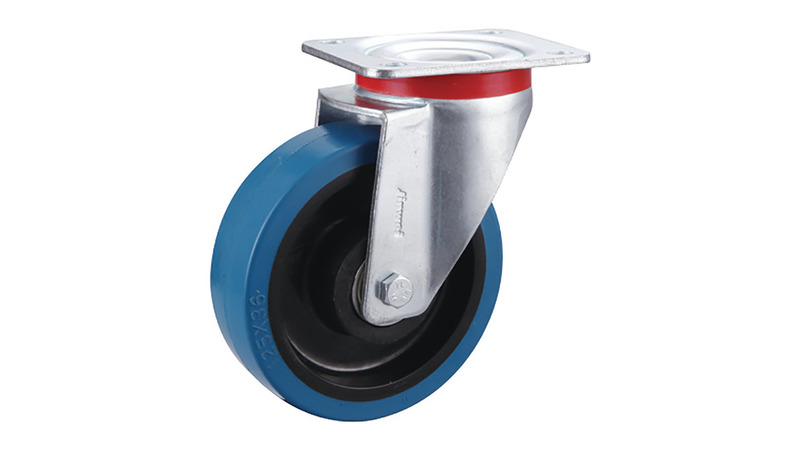 The wheel diameter is 125mm, the wheel width is 40mm, the hub bore length is 50mm , and the hub bore diameter is 15mm . The top plate size is 105x 80 mm, hole to hole diamater is 80x60mm , hole size is 9mm, offset is 36mm, total height is 155mm. The advantage is high load capacity ,low rolling resistance, wear resistance, reduce vibration,and quite opeartion.